i am reading the most astonishing book: 'the great wave: gilded age misfits, japanese eccentrics, and the opening of old japan,"
one of the great tales it contains is that of the visit to japan in 1886 made by john la farge and henry adams. and to the statues of kannon he comes upon in the forest. of this painting, the met says, La Farge used watercolor to make studies for illustrations and decorative projects, to record his travels, and, perhaps most eloquently, to paint floral still-life exhibition pieces. 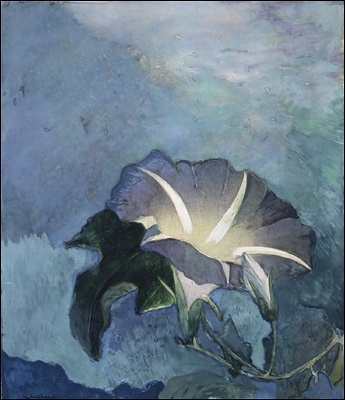 Nocturne typifies those still lifes in its poetic mood, its sensitive handling of the medium, and its integration of Japanese principles of design and color, which La Farge was one of the first American artists to appreciate. i just think it's so amazingly beautiful. and it's interesting that a morning glory should be called nocturne. note that whistler also named many of his pieces for types of music.